Hurricane Katrina and superstorm Sandy are just two examples of how extreme weather will intensify, it was reported in Australia's Climate Action Summit. In a speech on extreme weather in Sydney on June 22, 2013, Cook said about 90 per cent of global warming was going into the oceans, which act like a natural thermometer along with changes in land, ice, and animal species. "This isn't because animals are getting randier, it's because the seasons themselves are shifting," said Cook. 120 climate records were broken in Australia this January, including the hottest month and the hottest day. New colors had to be added to temperature maps to denote highs of over 50 and 54 degrees celsius. Cook said studies have tried to put a number on how much of global warming is caused by humans, "and the rough answer is, all of it". He said for the past two decades, 97% of scientists have been in agreement human activity is causing warmer temperatures. Permafrost: Is A Sleeping Climate Giant Stirring In The Arctic ? Over hundreds of millennia, Arctic permafrost soils have accumulated vast stores of organic carbon - an estimated 1,400 to 1,850 petagrams of it (a petagram is 2.2 trillion pounds, or 1 billion metric tons). That's about half of all the estimated organic carbon stored in Earth's soils. In comparison, about 350 petagrams of carbon have been emitted from all fossil-fuel combustion and human activities since 1850. Most of this carbon is located in thaw-vulnerable topsoils within 10 feet (3 meters) of the surface. But, as scientists are learning, permafrost - and its stored carbon - may not be as permanent as its name implies. And that has them concerned. "Permafrost soils are warming even faster than Arctic air temperatures - as much as 2.7 to 4.5 degrees Fahrenheit (1.5 to 2.5 degrees Celsius) in just the past 30 years. As heat from Earth's surface penetrates into permafrost, it threatens to mobilize these organic carbon reservoirs and release them into the atmosphere as carbon dioxide and methane, upsetting the Arctic 's carbon balance and greatly exacerbating global warming." Says research scientist Charles Miller of NASA's Jet Propulsion Laboratory, Pasadena , Calif.
Current climate models do not adequately account for the impact of climate change on permafrost and how its degradation may affect regional and global climate. Scientists want to know how much permafrost carbon may be vulnerable to release as Earth's climate warms, and how fast it may be released. Enter CARVE. Now in its third year, this NASA Earth Ventures program investigation is expanding our understanding of how the Arctic 's water and carbon cycles are linked to climate, as well as what effects fires and thawing permafrost are having on Arctic carbon emissions. CARVE is testing hypotheses that Arctic carbon reservoirs are vulnerable to climate warming, while delivering the first direct measurements and detailed regional maps of Arctic carbon dioxide and methane sources and demonstrating new remote sensing and modeling capabilities. About two dozen scientists from 12 institutions are participating. "The Arctic is warming dramatically - two to three times faster than mid-latitude regions - yet we lack sustained observations and accurate climate models to know with confidence how the balance of carbon among living things will respond to climate change and related phenomena in the 21st century. Changes in climate may trigger transformations that are simply not reversible within our lifetimes, potentially causing rapid changes in the Earth system that will require adaptations by people and ecosystems." The CARVE team flew test flights in 2011 and science flights in 2012. This April and May, they completed the first two of seven planned monthly campaigns in 2013, and they are currently flying their June campaign. 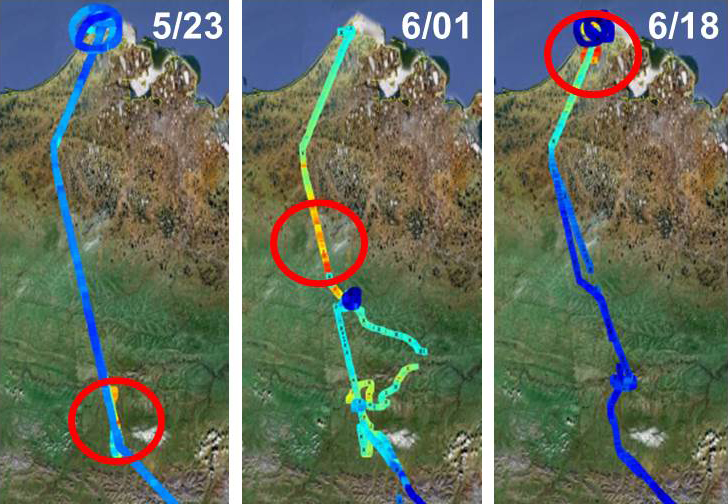 Each two-week flight campaign across the Alaskan Arctic is designed to capture seasonal variations in the Arctic carbon cycle: spring thaw in April/May, the peak of the summer growing season in June/July, and the annual fall refreeze and first snow in September/October. From a base in Fairbanks, Alaska, the C-23 flies up to eight hours a day to sites on Alaska's North Slope, interior and Yukon River Valley over tundra, permafrost, boreal forests, peatlands and wetlands. The C-23 makes up for in reliability and its ability to fly "down in the mud," so to speak. Most of the time, it flies about 500 feet (152 meters) above ground level, with periodic ascents to higher altitudes to collect background data. Most airborne missions measuring atmospheric carbon dioxide and methane do not fly as low. "CARVE shows you need to fly very close to the surface in the Arctic to capture the interesting exchanges of carbon taking place between Earth's surface and atmosphere," Miller said. Onboard the plane, sophisticated instruments "sniff" the atmosphere for greenhouse gases. They include a very sensitive spectrometer that analyzes sunlight reflected from Earth's surface to measure atmospheric carbon dioxide, methane and carbon monoxide. This instrument is an airborne simulator for NASA's Orbiting Carbon Observatory-2 (OCO-2) mission to be launched in 2014. Other instruments analyze air samples from outside the plane for the same chemicals. Aircraft navigation data and basic weather data are also collected. Initial data are delivered to scientists within 12 hours. Air samples are shipped to the University of Colorado 's Institute for Arctic and Alpine Research Stable Isotope Laboratory and Radiocarbon Laboratory in Boulder for analyses to determine the carbon's sources and whether it came from thawing permafrost. Miller says. "We are showing the power of using dependable, low-cost prop planes to make frequent, repeat measurements over time to look for changes from month to month and year to year." Ground observations complement the aircraft data and are used to calibrate and validate them. The ground sites serve as anchor points for CARVE's flight tracks. Ground data include air samples from tall towers and measurements of soil moisture and temperature to determine whether soil is frozen, thawed or flooded. It's important to accurately characterize the soils and state of the land surfaces. There's a strong correlation between soil characteristics and release of carbon dioxide and methane. Historically, the cold, wet soils of Arctic ecosystems have stored more carbon than they have released. If climate change causes the Arctic to get warmer and drier, scientists expect most of the carbon to be released as carbon dioxide. If it gets warmer and wetter, most will be in the form of methane. The distinction is critical. Molecule per molecule, methane is 22 times more potent as a greenhouse gas than carbon dioxide on a 100-year timescale, and 105 times more potent on a 20-year timescale. If just one percent of the permafrost carbon released over a short time period is methane, it will have the same greenhouse impact as the 99 percent that is released as carbon dioxide. Characterizing this methane to carbon dioxide ratio is a major CARVE objective. There are other correlations between Arctic soil characteristics and the release of carbon dioxide and methane. Variations in the timing of spring thaw and the length of the growing season have a major impact on vegetation productivity and whether high northern latitude regions generate or store carbon. CARVE is also studying wildfire impacts on the Arctic 's carbon cycle. Fires in boreal forests or tundra accelerate the thawing of permafrost and carbon release. Detailed fire observation records since 1942 show the average annual number of Alaska wildfires has increased, and fires with burn areas larger than 100,000 acres are occurring more frequently, trends scientists expect to accelerate in a warming Arctic . CARVE's simultaneous measurements of GHG will help quantify how much carbon is released to the atmosphere from fires in Alaska - a crucial and uncertain element of its carbon budget. What the CARVE science team is finding, Miller said, is both amazing and potentially troubling. "Some of the methane and carbon dioxide concentrations we've measured have been large, and we're seeing very different patterns from what models suggest," Miller said. "We saw large, regional-scale episodic bursts of higher-than-normal carbon dioxide and methane in interior Alaska and across the North Slope during the spring thaw, and they lasted until after the fall refreeze. To cite another example, in July 2012 we saw methane levels over swamps in the Innoko Wilderness that were 650 parts per billion higher than normal background levels. That's similar to what you might find in a large city." Ultimately, the scientists hope their observations will indicate whether an irreversible permafrost tipping point may be near at hand. While scientists don't yet believe the Arctic has reached that tipping point, no one knows for sure. "We hope CARVE may be able to find that 'smoking gun,' if one exists," Miller said. "The traditional view on Antarctic mass loss is it is almost entirely controlled by iceberg calving," said Eric Rignot of NASA's Jet Propulsion Laboratory in Pasadena , Calif. , and the University of California , Irvine . Rignot is lead author of the study to be published in the June 14 issue of the journal Science. "Our study shows melting from below by the ocean waters is larger, and this should change our perspective on the evolution of the ice sheet in a warming climate." The study found basal melting is distributed unevenly around the continent. 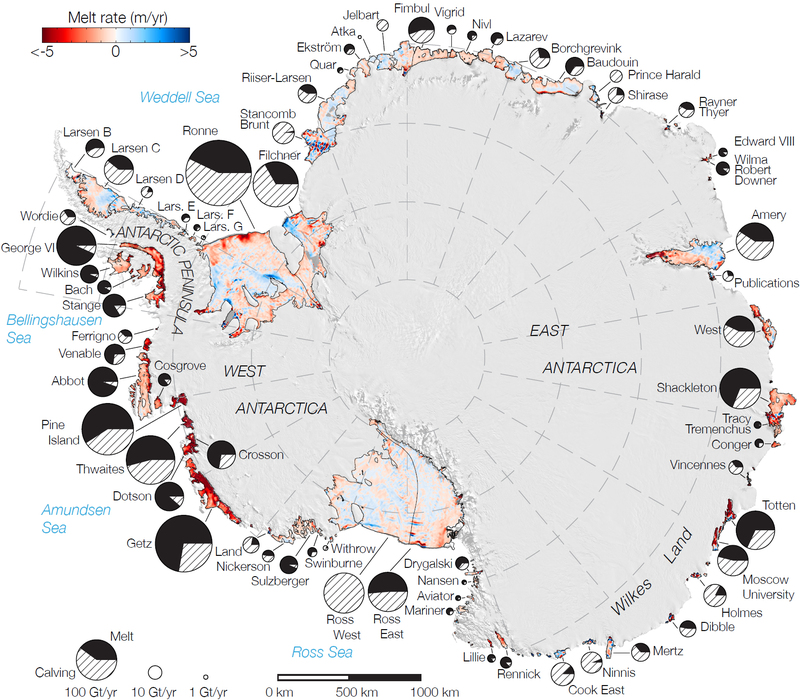 The three giant ice shelves of Ross, Filchner and Ronne, which make up two-thirds of the total Antarctic ice shelf area, accounted for only 15 percent of basal melting. Meanwhile, fewer than a dozen small ice shelves floating on "warm" waters (seawater only a few degrees above the freezing point) produced half of the total melt water during the same period. The scientists detected a similar high rate of basal melting under six small ice shelves along East Antarctica , a region not as well known because of a scarcity of measurements. "Ice shelf melt doesn't necessarily mean an ice shelf is decaying; it can be compensated by the ice flow from the continent," Rignot said. "But in a number of places around Antarctica , ice shelves are melting too fast, and a consequence of that is glaciers and the entire continent are changing as well." As an example India’s Ecological Footprint which measures the amount of productive land and sea area required to produce the resources it consumes and absorb its waste, has doubled since 1961, indicating growing scarcity of natural wealth. Today the country’s total demand on biocapacity is exceeded only by the United States and China. The recent United Nations Report on inclusive wealth published cost benefit balance-sheets for 20 countries in a report whose lead author is the Indian economist Partha Dasgupta. Assets included are: manufactured or physical capital machinery, buildings, infrastructure etc, human capital like the population’s education and skills and natural capital (including land, forests, fossil fuels and minerals. Such inclusive calculation of wealth need to be combined with broader measures of human progress as well as to get the big picture of sustainable economic growth in terms of the national accounts of cost and benefit analysis and net gain. This gap has now been filled in a substantial way by the United Nations Development Programme’s latest Human Development Report 2013. The United Nations’ HDI is an indicator of human development that measures a country’s achievements in the areas of longevity, education, and income. The Ecological Footprint measures a people’s demand on nature and can be compared to the available biocapacity. The value of integrating the two into one science-based evaluative framework is that sustainable human development depends on achieving better lives for all, within the resource budget available to the population. The latter means adequate access to ecological assets over the long-term. We need to realise and always keep in mind that human welfare is crucially dependent on healthy ecological assets. Painting a gloomy picture of the state of the world environment the UNEP report released in the run-up to the Rio+20 conference, said: The earth’s environmental systems are being pushed towards their biophysical limits. Several critical global, regional and local thresholds are close or have been exceeded. “Abrupt and possibly irreversible changes to the life-support functions of the planet are likely to occur.” The changes include rising oceans, increased frequency and severity of floods and droughts, and the collapse of fisheries. It said: Little or no progress has been made over the past five years on nearly a third of the main environmental goals including global warming. Significant progress has been made on just four of the 90 most important goals. The report said: 90 percent of water and fish samples are contaminated with pesticides; about 20 percent of vertebrate species are under threat of extinction; coral reefs have declined by 38 percent since 1980. More than 90 percent of those species formerly important to humans have been lost in coastal seas and estuaries, 35 percent of mangroves and 20 percent of all coral reefs have been destroyed. More than 30 percent of the world’s fish stocks are overexploited, depleted or recovering from depletion. Over 400 oxygen-poor ‘dead zones’ are in the world that include the Black Sea, Gulf of Mexico, Baltic Sea. These have significant negative impact on fisheries, food security and livelihoods. The world’s fishing fleets are double the size these should be and the potential economic gain from reducing fishing capacity to a sustainable, economically optimal level and restoring over-exploited and depleted fish stocks is of the order of US$50 billion per annum. The undernourishment of about 20 million people could have been averted without over-fishing. Invasive species threaten biodiversity, marine industries and human health. The global economic impact of invasive aquatic species is US$100 billion per year. The rate of marine bio-invasions is one every nine weeks and over 80 percent of the world’s 232 marine ecoregions found invasive species. Now, the manufactured fertilizer industry annually produces about 100 million tones of nitrogen in fertilizer. Today, 40-60 percent of global crop yields are attributable to commercial fertilizer use. The link between industrial agriculture and reactive nitrogen pollution is well established with impacts on drinking water. The impact of excess nitrogen in the EU alone is €70-320 billion per year. The energy consumption and associated environmental costs for fertilizer production are significant: 1-2 percent of all consumed global energy. Tourism, according to the report, is taking its toll: conversion of land for construction, declined biodiversity, destructed coastal wetlands, dune complexes and mangroves. Many coastal destinations have become heavily urbanized. For example, out of 8000 kilometers of Italian coastline, 43 percent is completely urbanized, 28 percent is partly urbanized. Only 29 percent of coastline could be considered ‘pristine’. Tourism accounts for about 5 percent of global emissions. Approximately 75 percent of this is caused by transports, and in particular aviation. Some states, the report said, have shown interest in deep sea mining, a new industry with many unknowns, beyond national jurisdiction. There is a legitimate concern regarding deep-sea mining and its economic and social consequences. Has the situation improved? The system that generates the crisis – crossing the earth’s capacity – has not changed its course and character, which is impossible for the world system, an ingrained incapacity of the system. Rather, the world finds a more deteriorated environmental reality as deepening crises – financial, economic and political – in the dominating world system, manifested in increment competition among capitals, and in invasions and aggressions, audaciously trample down peoples’ interests in countries. And, environment is one of the areas of peoples’ interests. Failure in a number of international negotiations on environmental issues is one of the images of competition among capitals engaged with environment demolishing activity. A forceful imposition of the environment-defacing regime is the order of the day. New areas are falling victim to it. Almost everyday news/facts of environmental erosion egress from corners of the world. It’s a bellum internecinum, a war of extermination, against all forms of life being waged by interests connecting Economy – Society – Politics – Environment (Ec-S-P-En) grid. Hunger, poverty and deprivation of millions of people in countries have been intensified by the financial/debt/banking/economic crises, and the so-called austerity measures, essentially measures to intensify appropriation of surplus labor and, even, necessary labor. Countries considered rich are now residences of millions of poor, unemployed, debt-ridden, homeless, hungry souls. Greece is not only a single example. Today’s capitalist world, the advanced capitalist countries reeling under the Great Financial Crisis, the countries in Asia-Africa-Latin America, is the example. Should the human crisis being authored by the financial, etc. crises be considered a non-environmental issue? Poverty, inequality, inequity are few of the biggest environmental problems in the present world. Reports on poverty, hunger, food, water, health, labor, employment, living condition pronounce this fact unequivocally. Agriculture is the livelihood of about 1.3 billion small farmers and landless workers, of which about half – close to 560 million – are women. (IPS, “Rural Women Are Leading the Way – Will the World Follow?”, part 1, Feb. 25, 2012) Farmers in the poor countries are thrown out of local market by artificially cheaper exports from the richer part of the world that dumps highly subsidized commodities in poor countries’ markets. A few years ago, India’s National Sample Survey Organization found more than 40 percent of farmers were keen to quit agriculture as a result of market pressures. Does the European Union’s Common Agriculture Policy, the regime mainly consisting of subsidies, stop the Union from threatening the poor farmers and food security in the poor countries? A new CAP is expected to come into effect in the beginning of 2014.
International Land Coalition stated that the demand for biofuels is driving more than 50 percent of large-scale land acquisitions world-wide. “Shell and BP invested heavily in Brazilian sugar cane last year. They want to remain leaders in the fuel sector. They are lobbying in Brussels.” (Daan Bauwens, “Biofuels and Hunger, Two Sides of the Same Coin”) A large percentage of Guatemala’s indigenous population is facing a new hunger crisis because of land grabbing, forced evictions and water diversion to create large-scale monoculture plantations for biofuel. ActionAid calculated that Europe’s target of producing biofuel would require converting up to 69,000 square kilometers of natural ecosystems into cropland, an area larger than Belgium and the Netherlands combined. The conversion would annually emit 56 million tonnes of extra CO2, the equivalent of an extra 12 to 26 million cars on Europe’s roads by 2020. Has this reality changed significantly? Rather, an “amazing”, actually, a hostile policy-environment prevails. Rajiv Shah, USAID’s chief administrator, announced that large-scale private sector partnerships would lead the way to a hunger-free world. Identifying 17 global “champions”, Shah named transnational giants as leaders in the fight against food insecurity. These included Archer Daniels Midland, BASF, Bunge, Cargill, Coca-Cola, DuPont, General Mills, Kraft Foods, Metro, Monsanto, Nestlé, PepsiCo, SABMiller, Syngenta, Unilever, Wal-Mart Stores and Yara International. But these companies have notorious track records in the areas of human and environmental rights. (Kanya D’Almeida, “Reimagining Food Systems in the Midst of a Hunger Crisis”, IPS, June 3, 2011) Profit driven governance of environment, plunder dictated governance, mal-governance, at national and international levels, and disenfranchising and disempowering peoples in countries have worsened the global environment reality. The network generates power with implications for the world environment. The TNCs’ political-military-media arms facilitate devouring of the world environment. Leslie Sklair observed: Concentrated capital accelerates the exploitation of natural resources by private entrepreneurs. (The Transnational Capitalist Class, 2001) Moreover, international trading regime “contributing” to erosion of world environment has not changed today. Section of economists from the South often penning pro-people words dream for an ideal society that will root out inequality, and they call for repurposing of market forces. The expression is blandae mendacia linguae, falsehood of a smooth tongue. They dare not admit that market forces are fundamentally and entirely anti-people, anti-environment, and are basically authoritarian and nihilist. Authoritarianism and nihilism does neither serve people nor environment, even in abstract sense, and, hypothetically, even if people are taken out from the environment and the environment is allowed to function only in physical term. Has not the world listened to the brutal epic of market for decades and experienced its “glorified” failures? Can the world forget the Shock Therapy of neoliberalism inflicted by the “famous” Chicago boys in the continent of Latin America as Naomi Klein depicted in her book? The price, the cost the humanity and the world environment paid for the barbaric market concert, a concert of robbing the humanity and the nature, is extraordinarily high. Was it possible for the world environment to get rid of that curse during the long period? Has the scenario basically changed around the world other than alternative initiatives in smaller parts in the south? Doesn’t this signify the state of the world environment today? There are efforts to perceive the global hunger catastrophe, an essential part of global environment, as an amalgamation of three distinct but inherently inter-related problems: poverty, environmental degradation, and an epidemic of malnutrition. (Olivier De Schutter, the UN Special Rapporteur on the Right to Food, Agroecology and the Right to Food, report presented to the Human Rights Council, March 2011) But these perceptions fail or dislike recognizing the sources of poverty, environmental degradation (ED) and epidemic of malnutrition (EM). Isn’t it the scientific approach to ask the reason behind poverty, ED, EM? What’s the force that creates/functions behind poverty, ED, EM? Isn’t it the economy that creates the degradations, etc.? Should the food crisis be ignored while assessing the state of the world environment? Should it be logical to ignore the forces – the “invisible”, cruel hands of speculators, the financialization, the centralized and concentrated market forces – creating the current global food crisis while assessing the global environment? Compartmentalizing the relationship of economic-political-environmental forces isn’t possible if a scientific approach is followed while assessing the world environment. Depriving hundreds of thousands of people of economic benefits Liberia has granted up to 60% of its rainforests to logging companies. These people depend on these forests. There were corrupt deals. (Reuters & BBC, Sept. 4, 2012) Liberia is only an example. States, many, bear the same signature of the same connection: to plunder the environment, economic interests operate with ruthless political machine. The extent and level differ only. The environment is not safeguarded as these states lack “political determination and strong governance”, a requirement suggested by the GEO 5. A list, prepared by mainstream or conservative think-tanks, of failed/near-to-failed states, and of countries experiencing aggression, intervention and civil war helps calculate the total number of population suffering from environmental catastrophe in those lands as failed state, “illiberal democracy”, war, etc. negatively impact environment. Should the fact be ignored while assessing the state of the world environment? Ignoring the fact – failed/near-failed states negatively affect the environment – will be an exercise in error. Considering the concept of happiness in national measurements of development, as Bhutan tries, will push anyone to an absolute void in any failed/near-failed state, and the issue of environment is part of development. Mainstream discussions on environment skip the issue of class interests. But individual, person or enterprise, can’t master the power and force that can deface the nature to today’s extent. Even smaller economies don’t have that money-power that can explore their own resources or potentials. Degrading the nature is a dream-impossible to them. Interests innovate, dominate and manipulate instruments – laws, conventions, institutions, technology, fire power, etc. – that are eroding the nature, from the deep depths of the oceans to the space and sun light. Despite Tûranor PlanetSolar’s successful expedition, the first solar powered vehicle’s circumnavigation of the globe, today’s world environmentscape, as the reality shows, reflects dominance by the predatory class interests and contradictions that are intensifying the world environment crisis, a human crisis. This is the concluding part of an article, the 1st part of which appeared in Countercurrents on June 4, 2013. Farooque Chowdhury is Dhaka-based freelancer. Today’s state of the world environment is the tribune of the crisis of capitalist civilization that carries all the contradictions the global economy creates; and the economy is owned by a handful of owners dispossessing the humanity, billions of the poor and the starved. The state of today’s global environment reflects the contradiction between the ownership of the world resources by a miniscule group and billions of resource-producing, but resource-starved humans, the contradiction created by an ever accumulating economy, the contradiction between ever greedy capital owners and humanity in chains. “Harmful environmental changes are taking place in an increasingly globalized, industrialized and interconnected world […]”(UNEP, GEO 5, Global Environment Outlook, Environment for the future we want, 2012) The reality is manifested in the waters, food, forests, crop fields, life of squatters, cities and rural communities, species on the verge of extinction, degenerated atmosphere, in the global production and distribution systems, wages, education, health care, investment and finance, flow of capital, “aid”, credit, consumption, luxury, wastage, opportunities for amenities and recreation, inequality, inequity, etc. Another random pick or purposive selection of media reports emanating from or study findings on different parts and different strata of societies around the globe will find similar incidents/process of degradation/loss/threat: another river instead of the Ganga, another lake instead of Dal, another canal instead of Hudiara, another locality, and the cases are not a single one, two or three. Latest findings on the oceans, glaciers, rain forests, food, energy, mining, chemical insecticides, urban life, living condition of working people – the most significant part of the humanity, reveal a singular fact: all forms of life on our planet is facing extinction. With the expansion of watch/observation period the number/magnitude increases. A gloom overpowers the perception of reality, a reality of an environmental catastrophe. The same pattern of consumption – a wasteful lot by a few and near-to-nothing by the overwhelming majority, the same super-run, essentially competition, for profit by interests, the same plunder, the same type of institutions and arrangements facilitating the ravenous run for plunder, and the same policies and power protecting the interests engaged with the plunder dominate the globe. Are these incidents disjunct and disconnected? Or, is there any connection between regions, practices, arrangements, institutions, policies, thrusts, interests, etc., parts of the capitalist civilization, that antagonistically dominate today’s world environment? Compartmentalization of the world environment isn’t possible. Water, soil, forest, air, biodiversity sustain life while, on the opposite, ever accumulation, driving force of the capitalist world economy, turns inconsiderate to the environment. Interests interact with all the aspects of environment. A careful observation will find a single connection that embarks its journey from economy (Ec), and ends up in today’s defaced-barren world environment (En) after crossing through society (S) and politics (P); in short, it’s EcEn, which is an Ec-S-P-En grid. Interests, connected through global class networks, generate the power that pushes the environment-defacing-journey – a process. What is the future likely to bring? A reasonable stance might be to try to look at the human species from the outside. So imagine that you’re an extraterrestrial observer who is trying to figure out what’s happening here or, for that matter, imagine you’re an historian 100 years from now -- assuming there are any historians 100 years from now, which is not obvious -- and you’re looking back at what’s happening today. You’d see something quite remarkable. Ecuador, which also has a large indigenous population, is the only oil exporter I know of where the government is seeking aid to help keep that oil in the ground, instead of producing and exporting it -- and the ground is where it ought to be. So that’s what the future historian -- if there is one -- would see. He might also read today’s scientific journals. Just about every one you open has a more dire prediction than the last. So that was the offer. Kennedy and his advisors considered it -- and rejected it. At the time, Kennedy himself was estimating the likelihood of nuclear war at a third to a half. So Kennedy was willing to accept a very high risk of massive destruction in order to establish the principle that we -- and only we -- have the right to offensive missiles beyond our borders, in fact anywhere we like, no matter what the risk to others -- and to ourselves, if matters fall out of control. We have that right, but no one else does. Kennedy did, however, accept a secret agreement to withdraw the missiles the U.S. was already withdrawing, as long as it was never made public. Khrushchev, in other words, had to openly withdraw the Russian missiles while the U.S. secretly withdrew its obsolete ones; that is, Khrushchev had to be humiliated and Kennedy had to maintain his macho image. He’s greatly praised for this: courage and coolness under threat, and so on. The horror of his decisions is not even mentioned -- try to find it on the record. Take the case of Iran, which is considered in the West -- not in the Arab world, not in Asia -- the gravest threat to world peace. It’s a Western obsession, and it’s interesting to look into the reasons for it, but I’ll put that aside here. Is there a way to deal with the supposed gravest threat to world peace? Actually there are quite a few. One way, a pretty sensible one, was proposed a couple of months ago at a meeting of the non-aligned countries in Tehran. In fact, they were just reiterating a proposal that’s been around for decades, pressed particularly by Egypt, and has been approved by the U.N. General Assembly. The proposal is to move toward establishing a nuclear-weapons-free zone in the region. That wouldn’t be the answer to everything, but it would be a pretty significant step forward. And there were ways to proceed. Under U.N. auspices, there was to be an international conference in Finland last December to try to implement plans to move toward this. What happened? You won’t read about it in the newspapers because it wasn’t reported -- only in specialist journals. In early November, Iran agreed to attend the meeting. A couple of days later Obama cancelled the meeting, saying the time wasn’t right. The European Parliament issued a statement calling for it to continue, as did the Arab states. Nothing resulted. So we’ll move toward ever-harsher sanctions against the Iranian population -- it doesn’t hurt the regime -- and maybe war. Who knows what will happen? Bear in mind that the North Korean leadership is likely to have read the public military journals of this superpower at that time explaining that, since everything else in North Korea had been destroyed, the air force was sent to destroy North Korea’s dams, huge dams that controlled the water supply -- a war crime, by the way, for which people were hanged in Nuremberg. And these official journals were talking excitedly about how wonderful it was to see the water pouring down, digging out the valleys, and the Asians scurrying around trying to survive. The journals were exulting in what this meant to those “Asians,” horrors beyond our imagination. It meant the destruction of their rice crop, which in turn meant starvation and death. How magnificent! It’s not in our memory, but it’s in their memory. Let’s turn to the present. There’s an interesting recent history. In 1993, Israel and North Korea were moving towards an agreement in which North Korea would stop sending any missiles or military technology to the Middle East and Israel would recognize that country. President Clinton intervened and blocked it. Shortly after that, in retaliation, North Korea carried out a minor missile test. The U.S. and North Korea did then reach a framework agreement in 1994 that halted its nuclear work and was more or less honored by both sides. When George W. Bush came into office, North Korea had maybe one nuclear weapon and verifiably wasn’t producing any more. Bush immediately launched his aggressive militarism, threatening North Korea -- “axis of evil” and all that -- so North Korea got back to work on its nuclear program. By the time Bush left office, they had eight to 10 nuclear weapons and a missile system, another great neocon achievement. In between, other things happened. In 2005, the U.S. and North Korea actually reached an agreement in which North Korea was to end all nuclear weapons and missile development. In return, the West, but mainly the United States, was to provide a light-water reactor for its medical needs and end aggressive statements. They would then form a nonaggression pact and move toward accommodation. Lately, for instance, there have been South Korean-U.S. military exercises on the Korean peninsula which, from the North’s point of view, have got to look threatening. We’d think they were threatening if they were going on in Canada and aimed at us. In the course of these, the most advanced bombers in history, Stealth B-2s and B-52s, are carrying out simulated nuclear bombing attacks right on North Korea’s borders. Noam Chomsky is Institute Professor Emeritus in the MIT Department of Linguistics and Philosophy. He is the author of numerous best-selling political works, including Hopes and Prospects, Making the Future, and most recently (with interviewer David Barsamian), Power Systems: Conversations on Global Democratic Uprisings and the New Challenges to U.S. Empire (The American Empire Project, Metropolitan Books). (Madison, WI) - Ecological Internet (EI) is enormously pleased to note British Columbia (B.C. ), Canada's thumbs down to the proposed Northern Gateway tar sand pipeline. Announced yesterday, the decision virtually guarantees that the flow of filthy tar sands oil from Canada's interior to China will not commence through a Western Pacific route any time soon. EI was the first to protest internationally on the issue, doing so since 2010, over a full year earlier than other global affinity efforts - successfully laying the groundwork for the victory. EI's President, Dr. Glen Barry, states: "The B.C. pipeline victory against tar sands ecocide is the results of innumerable instances of valor by indigenous, local, and global tar sands protesters. Yet is also again clearly demonstrates Ecological Internet and online colleagues' ability to be at the vanguard of environmental protest, helping mobilize online large global coalitions that are ultimately successful. This is a stunning victory for indigenous, local, and global people power, and illustrates the importance of funding small ecological opposition groups, and taking strong biocentric positions against environmental risk." In urging a Canadian federal review panel to reject the $6 billion plan, the province of British Columbia noted the lack of a cleanup plan for inevitable spills, and the many unknowns about how highly corrosive bitumen behaved after spills, particularly in water. The pipeline would have crossed remote and extremely difficult terrain; through pristine rivers, temperate rainforests, and marine environments, that would be devastated in the event of a spill. The province's opposition has probably doomed the pipeline, or at least will tie it up in endless litigation. The Northern Gateway project - composed of two separate pipelines - would extend about 700 miles from the Alberta tar sands to a tanker port on the northern coast of British Columbia. It would have the capacity to ship more than 525,000 barrels of oil per day. The rejection of the pipelines - which were to have given Alberta an outlet to Pacific coast ports and markets in China - further raises the stakes on another controversial tar sands pipeline, the Keystone XL. The Enbridge Northern Gateway Project as proposed included a twin pipeline system between Edmonton, Alberta and a new marine terminal in Kitimat, British Columbia, which would carry tar sands oil by pipeline across B.C., to be loaded onto supertankers at an ocean terminal, and onward to Asia. Canadian tar sands production would have been able to expand by 30% - escalating the terrible ecological impacts upon the Canadian boreal forests and its water, carbon and ecosystems. The pipelines would go through B.C. 's sensitive Pacific North Coast ecosystem, and threatens First Nations' land and salmon economy. One mishap - such as project developer Enbridge's broken pipelines fouling the Yellowstone and Kalamazoo rivers - would bring disastrous results and long-term loss of marine life, pristine waterways, and sensitive coastal ecosystems. In mid-2010, Ecological Internet launched our signature Internet protest targeting the B.C. provincial government and the Enbridge Northern Gateway joint review panel considering the project's environmental approvals . At one time the volume of protest emails sent was so large that efforts were made to block them, which after EI took counter-measures, instead were accepted and acknowledged. Nearly one half of a million protest emails were sent. The pipeline had already been delayed for at least a year in December of 2011 by the review panel who noted "significant public interest in the Northern Gateway project." After spearheading that delay, Dr. Barry noted: "Ecological Internet is thrilled to have played a small yet important part amongst such massive anti-tar sands opposition. These delays make it possible for us together to continue highlighting how clearcut mining boreal forests, fouling water and land, to transport haphazardly through important ecosystems, to be burned causing abrupt climate change is simply not acceptable." Australian scientists have narrowed the predicted range of global warming through groundbreaking new research . The scientists have generated more reliable projections of global warming estimates at 2100. A study-findings, presented in a paper, said exceeding 6 degrees warming was now unlikely while exceeding 2 degrees is very likely for business-as-usual emissions. The paper, led by Dr Roger Bodman, Postgraduate Research Fellow at Victoria University's Centre for Strategic Economic Studies, with Professors David Karoly and Peter Rayner from the University of Melbourne's School of Earth Sciences and the ARC Centre of Excellence for Climate System Science has been published in Nature Climate Change on May 27, 2013. The finding was achieved through a new method combining observations of carbon dioxide and global temperature variations with simple climate model simulations to project future global warming. Dr Bodman said while continuing to narrow the range even further was possible, significant uncertainty in warming predictions would always remain due to the complexity of climate change drivers. "This study ultimately shows why waiting for certainty will fail as a strategy," he said. "Some uncertainty will always remain, meaning that we need to manage the risks of warming with the knowledge we have." 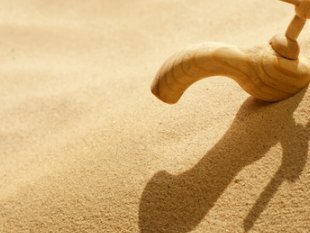 The study found 63% of uncertainty in projected warming was due to single sources – such as climate sensitivity, followed by future behavior of the carbon cycle and the cooling effect of aerosols – while 37% of uncertainty came from the combination of these sources. "This means that if any single uncertainty is reduced – even the most important, climate sensitivity – significant uncertainty will remain," Dr Bodman said. Professor Karoly said the study reinforced the importance of strong action on climate change. "Our results reconfirm the need for urgent and substantial reductions in greenhouse gas emissions if the world is to avoid exceeding the global warming target of 2 degrees needed to minimize dangerous climate change," he said. The 21st century will be a time of crisis for human civilization. We are facing an environmental megacatastrophe, financial meltdown, and the threat of nuclear war. Politicians seem unable or unwilling to address these problems, becuse they are influenced by powerful lobbies. It is up to individual citizens to force their governments to take action, and if they will not do so, to work for a change of governments. One of the greatest problems in mobilising individuals to become active problem-solvers is that the problems are not so apparent today as they will become in the future. Our present era has the appearance of a golden age. All curves are moving upward: population, gross national products, fossil fuel use, the rate of scientific and technological discovery, industrialization of the developing countries, and so on. All are growing. Never before in history have there been so many people; never before has there been so much collective and individual wealth; never before has there been so much knowledge; never before so many inventions. Ordinary people in China and India are experience levels of well-being that they never had before. Smart phones and Ipads are commonplace in Mongolia and Kenya. Automobile traffic fills all eight lanes of highways in Manilla. The Internet makes the knowledge and culture of the entire world instantly available to all of its citizens. Science and technology are triumphant. It is indeed a golden age. But although we are experiencing a golden age, the fact that we have reached a peak implies that ahead of us lies a period of decline, a period of scarcity, a period of economic trauma, and a period of ecological catastrophe. The severity of the decline, and of the scarcity, trauma and ecological catastrophe depends on the actions of ordinary people living today. But how can we mobilize ordinary citizens to the action that will be needed to save civilization and the biosphere when they are lulled into inaction, both by the stupifying trivia of the mass media and by the pleasures of their daily lives? According to the Hubbert Peak Model, the time-dependence of the production and use of any non-renewable resource follows a bell-shaped curve. When the resource is approximately half exhausted, production and consumption reach a maximum. Thereafter they gradually decline. As the decline continues, the resource does not disappear entirely, but its price increases, partly because of increased costs of extraction, and partly because the demand for the resource exceeds the supply. This model of the time-dependence of use of a non-renewable resource was introduced in 1956 by the geophysicist and oil expert M. K. Hubbert, who predicted that the production and consumption of conventional oil in the 49 contiguous states of the US would follow such a curve, and that the peak would occur in the early 1970's. Although this prediction was met with skepticism, it proved to be surprisingly accurate. In many other cases since that time, the Hubbert Peak Model has been vindicated by accurate predictions. When it is applied to the global production and consumption of conventional oil and natural gas, the Hubert Peak Model predicts that a peak for oil will occur within a few years, and that a peak for natural gas will follow by 2020 or 2030. Supplies of coal are much larger. Burned at the present rate, they would last roughly a thousand years. Burned at a rate that would be needed to compensate for the end of oil and natural gas, coal would last only until the end of the 21st century. But to avoid disastrous climate change, we need to leave the world's reserves of coal in the ground, rather than burning them. Thus the fossil fuel era is ending, and its end will have an enormous impact on human society. 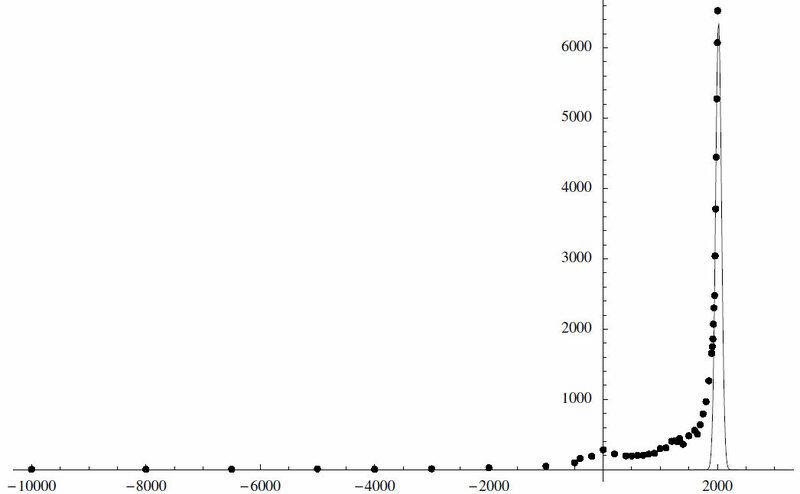 Global population and fossil fuel use plotted on a time scale of several thousand years. The dots represent population estimates, while the spike-like curve is fossil fuel use. When plotted together, the explosive growth of population and the upward surge of fossil fuel consumption are seen to be simultaneous, and probably causally connected. When plotted together on a time-scale of several thousand years, the global population of humans and the use of fossil fuels show a dramatic and worrying behavior: The world's human population remained at a very low level for millenia, at the level of only a few millions. But driven by the inventions of the industrial and scientific revolutions, population has shot upward, and is now increasing by roughly a billion every 11 years. When plotted on the same graph, fossil fuel use shows a remarkable spikelike behavior. Starting almost at zero a few hundred years ago, it rises to a sharp peak today, and in the future it will fall to almost nothing again, all within the space of a few hundred years. When plotted together, the spikelike graph of fossil fuel use, and the dramatic upsurge in global population are seen to be simultaneous. This raises the worrying question of whether the explosion of global population has been caused by fossil fuel use, and whether there will be a population crash when these fuels are exhausted. Petroleum and natural gas, upon which modern agriculture depends, will become prohibitively expensive in 2040 or so, just when the global population of humans reaches the unprecedented level of 9 billion. Modern agriculture, the basis of our enormous population, will be dealt a severe blow by the end of the fossil fuel era. At the same time, melting of glaciers in the Himalayas will deprive both China and India of their summer water supplies. Rising sea levels will drown many productive rice-growing regions in Southeast Asia. Aridity produced by global warming will reduce the output of grain in many areas that are now important producers of wheat, maize and soy beans. Thus, added to the threat of nuclear war, is the threat of global famine on a scale never before experienced, involving billions rather than millions of people. We need to act today to save the future. We need to stabilize global population today; we need to achieve world peace today; we need to abolish nuclear weapons today; we need to drastically reduce the emmission of greenhouse gasses today; we need to make the transition to renewable energy today; we need to stop overefishing today; we need agricultural research today; we need to save the rainforests today; we need to conserve topsoil today. But today is so comfortable, today is the golden age of humankind. Yes it is, it certainly is, but we must act today. Tomorrow will be too late. The majority of the 9 billion people on Earth will live with severe pressure on fresh water within the space of two generations as climate change, pollution and over-use of resources take their toll. The world's water systems would soon reach a tipping point that "could trigger irreversible change with potentially catastrophic consequences", the water experts warned on May 25, 2013 as they called on governments to start conserving the vital resource. They said it was wrong to see fresh water as an endlessly renewable resource because, in many cases, people are pumping out water from underground sources at such a rate that it will not be restored within several lifetimes. "These are self-inflicted wounds," said Charles Vörösmarty, a professor at the Cooperative Remote Sensing Science and Technology Centre. "We have discovered tipping points in the system. Already, there are 1 billion people relying on ground water supplies that are simply not there as renewable water supplies." A majority of the population – about 4.5 billion people globally – already live within 50km of an "impaired" water resource – one that is running dry, or polluted. If these trends continue, millions more will see the water on which they depend running out or so filthy that it no longer supports life. The threats are numerous. Climate change is likely to cause an increase in the frequency and severity of droughts, floods, heatwaves and storms. The run-off from agricultural fertilizers containing nitrogen has already created more than 200 large "dead zones" in seas, near to river mouths, where fish can no longer live. Cheap technology to pump water from underground and rivers, and few restrictions on its use, has led to the over-use of scarce resources for irrigation or industrial purposes, with much of the water wasted because of poor techniques. And a rapidly rising population has increased demand beyond the capability of some water resources. In some areas, so much water has been pumped out from underground that salt water has rushed in to fill the gap, forcing farmers to move to other areas because the salination makes their former water sources unusable. Most of the areas where water will be scarcest soonest are in poor countries, which have little resilience to cope. Many are also in areas where there is already political instability, tension or outright conflict, and the competition for water resources will heighten these problems. But the scientists warned that the developed world would also suffer. For instance, there are now 210 million citizens of the US living within 10 miles of an "impaired" water source, and that number is likely to rise as the effects of global warming take hold. In Europe, some water sources are running dry because of over-extraction for irrigation, much of which is carried on in an unsustainable fashion. Pollutants are also causing severe problems in the rich world – the scientists highlighted the role of endocrine disruptors, which can cause fish to change gender, and the long-term effects of which on human populations are as yet barely known. "There is no citizen of the world who can be complacent about this," said Janos Bogardy, director of the UN University's Institute for Environment and Human Security. On May 22, 2013, UN secretary general, Ban Ki-moon, added his voice to concerns about water security: "We live in an increasingly water insecure world where demand often outstrips supply and where water quality often fails to meet minimum standards. Under current trends, future demands for water will not be met," he said. The scientists, meeting in Bonn this week, called on politicians to include tough new targets on improving water in the sustainable development goals that will be introduced when the current millennium development goals expire in 2015. They want governments to introduce water management systems that will address the problems of pollution, over-use, wastage and climate change. Glaciers on or around Mount Everest have shrunk by 13% in the last 50 years with the snow line 180 meters higher than it was 50 years ago. The glaciers are disappearing faster every year. The impact of climate change on the Himalayas will have consequences across south Asia and beyond. Rivers such as the Indus, Ganges and Brahmaputra depend to some extent on seasonal glacier melt. Countries across the region are already suffering acute water shortages. The 60th anniversary of the first ascent of the 8,848 metre (29,028ft) peak by Sir Edmund Hillary and Sherpa Tenzing Norgay will be celebrated next week. The researchers suspect that the decline of snow and ice in the Everest region is a result of changes in global climate caused by human-generated GHG. However, they have not yet established a firm connection, Sudeep Thakuri, who led the team, said. The landscape around Mount Everest has changed dramatically since the world's highest mountain was first climbed. Mountaineers now report more rock and less snow and ice on well known routes. The ends of glaciers around the peak have also retreated by an average of 400 meters since 1962, the new research found, and some smaller glaciers were now nearly half the size they were in the 1960s. The researchers used satellite imagery of the peak and the 713-square-mile Sagarmatha national park around the mountain as well as long-term meteorological data. Small glaciers of less than a square kilometer (about 247 acres), are vanishing fastest, registering a 43% decline in surface area since the 1960s, Thakuri said. Specialists in Kathmandu said the rate of change through the Himalayas was variable. Though clear in places such as Nepal, at the eastern end of the chain, the situation was different in Pakistan and further west, said Arun Shrestha of the International Centre for Integrated Mountain Development in Kathmandu. "The glaciers are in retreat but rates are different," he said. "It is quite rapid in the east Himalaya but in the west some are advancing while others are in retreat." Other research suggests the ice of the main Khumbu glacier which flows down from Everest is less thick than it was previously. Though all say there is a change, scientists working in the field urge caution over any estimates, saying data is insufficient especially when looking at a small area. "It is very difficult to scientifically say what are the trends on one particular mountain," Shrestha said. "The Himalayan glaciers and ice caps are considered a water tower for Asia since they store and supply water downstream during the dry season," said Thakuri. "Downstream populations are dependent on the melt water for agriculture, drinking and power production." Chapter 1: Minus One Hundred Twenty-Two Meters and Climbing. On October 28, 2012, Hurricane Sandy, the largest Atlantic hurricane on record, came ashore in New Jersey. Sandy’s assault and sea surge brought the ocean into neighborhoods and houses, inundated parking lots and tunnels, turned parks into lakes. When it was all over and the water receded, a huge swath of the Northeast American coast looked like a battered moonscape. Only Hurricane Katrina, which devastated New Orleans in 2005, was more costly. Katrina, with its gigantic sea surge, had been a wakeup call for people living on low- lying coasts, but the disaster soon receded from the public consciousness. Sandy struck in the heart of the densely populated Northeastern Corridor of the United States seven years later and impacted the lives of millions of people. The storm was an epochal demonstration of the power of an attacking ocean to destroy and kill in a world where tens of millions of people live on coastlines close to sea level. This time, people really sat up and took notice in the face of an extreme weather event of a type likely to be more commonplace in a warmer future. As this book goes to press, a serious debate about rising sea levels and the hazards they pose for humanity may have ?nally begun—but perhaps not. Sandy developed out of a tropical depression south of Kingston, Jamaica, on October 22. Two days later, it passed over Jamaica, then over Cuba and Haiti, killing seventy-one people, before traversing the Bahamas. Come October 28, Sandy strengthened again, eventually makinglandfall about 8 kilometers southwest of Atlantic City, New Jersey, with winds of 150 kilometers an hour. By then, Sandy was not only an unusually large hurricane but also a hybrid storm. A strong Arctic air pattern to the north forced Sandy to take a sharp left into the heavy populated Northeast when normally it would have veered into the open Atlantic and dissipated there. The blend produced a super storm with a wind diameter of 1,850 kilometers, said to be the largest since 1888, when far fewer people lived along the coast and in New York. Unfortunately, the tempest also arrived at a full moon with its astronomical high tides. Sandy was only a Category 1 hurricane, but it triggered a major natural disaster partly because it descended on a densely populated seaboard where thousands of houses and other property lie within a few meters of sea level. Imagine the destruction a Category 5 storm would have wrought— something that could happen in the future. The scale of destruction was mind-boggling. Sandy brought torrential downpours, heavy snowfall, and exceptionally high winds to an area of the eastern United States larger than Europe. Over one hundred people died in the affected states, forty of them in New York City. The storm cut off electricity for days for over 4.8 million customers in 15 states and the District of Columbia, 1,514,147 of them in New York alone. Most destructive of all, a powerful, record-breaking 4.26-meter sea surge swept into New York Harbor on the evening of October 29. The rising waters inundated streets, tunnels, and subways in Lower Manhattan, Staten Island, and elsewhere. Fires caused by electrical explosions and downed power wires destroyed homes and businesses, over one hundred residences in the Breezy Point area of Queens alone. Even the Ground Zero construction site was ?ooded. Fortunately, the authorities had advance warning. In advance of the storm, all public transit systems were shut down, ferry ser vices were suspended, and airports closed until it was safe to ?y. All major bridges and tunnels into the city were closed. The New York Stock Exchange shut down for two days. Initial recovery was slow, with shortages of gasoline causing long lines. Rapid transit systems slowly restored service, but the damage caused by the storm surge in lower Manhattan delayed reopening of critical links for days. The New Jersey Shore, an iconic vacation area in the Northeast, suffered worst of all. For almost 150 years, people from hot, crowded cities have ?ocked to the Shore to lie on its beaches, families often going to the same place for generations. They eat ice cream and pizza, play in arcades once used by their grandparents, drink in bars, and go to church. The Shore could be a seedy place, fraught with racial tensions, and sometimes crime and violence, but there was always something for everybody, be they a wealthy resident of a mansion, a contestant in a Miss America pageant, a reality TV actor, a skinny-dipper, or a musician. Bruce Springsteen grew up along the Shore and his second album featured the song “4th of July, Asbury Park (Sandy),” an ode to a girl of that name and the Shore. “Sandy, the aurora is rising behind us; the pier lights our carnival life forever,” he sang. The words have taken on new meaning since the hurricane came. Fortunately, the residents were warned in advance of the storm. They were advised to evacuate their homes as early as October 26. Two days later, the order became mandatory. New Jersey governor Chris Christie also ordered the closure of Atlantic City’s casinos, a decision that proved wise when Sandy swept ashore with brutal force, pulverizing long-established businesses, boardwalks, and homes. Atlantic City started a trend when it built its ? rst boardwalk in 1870 to stop visitors from tracking sand into hotels. Boardwalk amusements are big business today, many of them faced by boardwalks that are as much as a 0.8-kilometer from the waves. Now many of the Shore’s iconic boardwalks are history. The waves and storm surge destroyed a roller coaster in Seaside Heights; it lay half submerged in the breakers. Seaside Heights itself was evacuated because of gas leaks and other dangers. Piers and carousels vanished; bars and restaurants were reduced to rubble. Bridges to barrier islands buckled, leaving residents unable to return home. The Shore may be rebuilt, but it will never be the same. A long-lived tradition has been interrupted, perhaps never to return. For all the fervent vows that the Shore will rise again, no one knows what will come back in its place along a coastline where the ocean, not humanity, is master. As the waters of destruction receded, they left $50 billion of damage behind them, and a sobering reminder of the hazards millions of people face along the densely populated eastern coast of the United States. Like Hurricanes Katrina in 2005 and Irene in 2011, Sandy showed us in no uncertain terms that a higher incidence of extreme weather events with their attendant sea surges threaten low-lying communities along much of the East Coast— from Rhode Island and Delaware to the Chesapeake and parts of Washington, DC, and far south along the Carolina coasts and into Florida, which escaped the full brunt of Sandy’s fury. There, high windsand waves washed sand onto coastal roads and there was some coastal ?ooding, a warning of what would certainly occur should a major hurricane come ashore in Central or Southern Florida—and the question is not if such an event will occur, but when. Extreme weather events come in many forms— blanketing snowstorms, tornadoes, torrential rainfall, and long-enduring droughts, to mention only a few. However, the most dangerous are hurricanes and tropical cyclones, which generate not only powerful winds and sheets of rain, but also violent sea surges. The infamous Hurricane Katrina, which devastated New Orleans in 2005, alerted us forcibly to the dangers of exceptional storms along low coasts besieged by subsidence and rising sea levels. As we describe in chapter 13, much of the damage and loss of life came not from the hurricane-force winds and rain, but from the sea surge and high tides that followed on the storm. Raging waters swept ashore and carried away entire parishes and massive arti?cial levees that protected low-lying parts of New Orleans. Hurricanes like Katrina generate sea surges by the wind blowing directly toward shore and pushing water up onto the land. This is what devastated the Mississippi delta in 2005 and Galveston, Texas, in September 1900, when a hurricane-generated surge ?ooded the city streets to a depth of at least six meters, destroying thirty-?ve hundred buildings and killing over six thousand people. Since the Galveston disaster, improved early warning systems, seawalls, and stronger buildings have reduced casualties in better- developed parts of the world, but rising urban populations and the complex and expensive logistics of warning, evacuation, and recovery make it increasingly dif? cult to avoid truly catastrophic human and material destruction. Tropical cyclones are a major hazard in many parts of the world, notably in the western Paci? c and the Bay of Bengal. Low-lying Bangladesh is basically a huge river delta at the head of the bay, where tropical cyclones breed, cover large areas, and move northward into the funnel created by the coasts on either side of the ocean. We are already reaping a whirlwind of vicious assaults by an ocean that once lay 122 meters below today’s threatened shorelines. Billions of people are at risk from an attacking sea. Our future will be challenging, even before one factors in the ever-present threat of earthquakes and tsunamis. 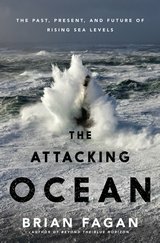 As history shows us, our vulnerability to an encroaching and often aggressive ocean has increased exponentially, especially since the rapid population growth of the Industrial Revolution. While as recently as eight thousand years ago, only a few tens of thousands of people lived at risk from rising waters—and they could adapt readily by upping stakes and moving—today millions of us live in imminent danger from the attacking ocean and from the savage weather events that await in a warmer future. Published with permission from Bloomsbury Press. p class="p1">A couple years ago I was asked by theKeepers of the Athabasca to be the Master of Ceremonies for a very different kind of event. It took place in the region of the most controversial energy project on earth, the Canadian tar sands. The idea was not to have a protest, but instead to engage in a meaningful ceremonial action to pray for the healing of Mother Earth, which has been so damaged by the tar sands industry. Community members of the five First Nations of the Athabasca region and the town of Fort McMurray, tired of the consistent negativity and never ending fight with big oil and government, had made a conscientious choice to find another source of power in the struggle to protect their way of life. This was done by turning to ceremony and asking through prayer and the physical act of walking on the earth so that the hearts of those harming her (Mother Earth) through extreme energy extraction could be healed. My journey started in to Fort McMurray, Alberta, also known as tar sands boom town. Many have described this place as the land of milk and honey, a place were you can trade five years of your life (and soul) and be financially “set up.” I met with a motley crew of activists, sovereigntists, elders and youth from Fort Chipewyan, Fort McKay, Anzac and the metro-areas of Calgary and Edmonton, as well as some allies who had traveled from as far as British Columbia, and beyond. The plan was to take vehicles to the beginning of the infamous Highway 63 ring through the tar sands. This 60km stretch of road has gained a notorious reputation of being the highway of death, due to the tremendous amount of people who have died in horrific auto accidents inrecent years. It is always busy with peak traffic rivalling that of downtown New York, the traffic gets especially heavy during two daily shift changes. Then, our plan was to pray, make offerings to the four directions and walk through the heart of tar sands development as concerned Elders, parents, youth and grandchildren. Highway 63 is the only road to Fort McKay Cree Nation, one of Canada's most polluted, yet richest First Nations, where water needs to be trucked in daily to meet the communities needs. The 63 loops past vast human made deserts in the form of tailings ponds wet and dry, and then past an archaic Suncor/Petro-Canada facility with black carbon stained cracking towers, belching hellfire into the morning sky. The highway finally meets the junction to get to Fort McKay and continues onward past the industrial metropolis that is Syncrude, Canada's largest tar sands operator, operated laregly by Exxon Oil .The Syncrude site is like something straight out of a science fiction movie. From the road, you can see glimmering stainless steel cracking towers, which separate bitumen into synthetic oil, a massive tank farm, lego-like worker sleeping facilities stacked upon one another, and half-built pyramids of sulfur (a waste by-product of the bitumen upgrading process) being built toward the sky like two biblical towers of Babel. Then comes the last major and probably most absurd element of insanity on the Highway 63 loop: the buffalo demonstration project and reclamation site. Yeah, you heard right. Some executive from Syncrude got it into their head that having live buffalo, living under the stacks of their tar sands upgrader would be a good thing for the image of the tar sands industry. A herd of the most symbolic animals of our native heritage is subject to a slow poisonous death, its members grazing in toxic fields with an apocalyptic backdrop of tailings ponds and smoke stacks billowing white clouds of toxic death overhead. But the absurdity doesn’t end there. The 15km loop end around this tarmageddon ends with the buffalo demonstration site, connected by a short access road to where our walk began. A few years back, some of these poor beasts were culled and distributed to elders in local First Nations. The communities were rightfully paranoid about the toxicity of the meat. Instead of eating it, they had it sent away and tested. The tests came back showing that the meat was poisoned with heavy metals and other toxic compounds, which was present in concentrations hundreds of times above what is deemed acceptable for human consumption. With these very real fears in our minds, we chose to listen instead to our hearts and to allow ourselves to be lead by local First Nations elders into the tar sands Highway 63 loop. What I saw on the walk generated a sick feeling in my heart that was so twisted I feel like I cannot articulate it. But I can try. The landscape was unlike anything I had ever seen before. Taking the time to walk through what I have described was life changing. I walked past a tailings pond so big you that it covers the horizon for miles to see a 24 inch pipe coming from Syncrude spewing a meters high flow of liquid hydro-carbon waste so toxic thatwater fowl who land in it diewithin minutes. We saw from ground level and up close, the hellfires of the Suncor/Petro-Canada stacks with their 50 foot flames shooting up into the sky, day and night. Their proximity to the Athabasca river made me wonder what madness allowed Suncor to build them 500 meters away from the precious river that so many First Nations, Metis and Inuit communities depend on for water? As we walked that first time, I pondered all of the battlefields that the emerging international movement to stop the tar sands its associated infrastructure of pipelines, refineries and shipping lanes is engaged with. I was overcome by the magnitude of our undertaking, picking a fight with the most inhumane and most richest richest corporations on the planet, big oil and their lobby. Over that day, as I put one foot in front of the other, I came to realize that if we did not focus our best efforts on stopping the emergence of the era of extreme energy that this wasteland represented here in Athabasca, we would be locked into a series of never ending pipelines shipping lane and refinery fights across the continent. No, I thought, that cannot work. This beast must be smothered to death at the source. At the beginning of the day, before the walk started, there was an argument about the right way to do the ceremony. What I know is that a bear showed itself to us at the start of our walk and that it carried with it the teachings of courage and protection. Later, an eagle flew over us and it represented the teaching of truth and unconditional love. While we walked, we made offerings of tobacco and water on four strategic points along Highway 63. Those offerings were to pray to each of the four directions and to call upon spirit, creator, mother earth and all of the sacred elements to both heal the land and to touch the hearts, minds and spirits of those responsible for her desecration. This was done so that the people destroying her could truly understand what they were doing... and wake up. The tar sands healing walk was one of the most powerful ceremonies I have ever been to, comparable to our most sacred ceremony back home: the Sundance. Something happened when we all decided to take a break from the battle with big oil, national and provincial governments and the banks that finance them. When we decided to focus instead all of our intentions, all of our power and all of our love to heal our most sacred Mother and those that depend on her health through prayer, ceremony and the physical act of walking together, we lead with our hearts. This year is the fourth Annual Healing Walk, which in many Native circles is a very significant number: four directions, four nations of the earth. This walk marks, the end of a cycle and perhaps the beginning of a new era in the battle against big oil. The Walk will take place in Fort McMurray, Alberta from the 4th to the 6th of July, 2013. The former Chief of Smith’s Landing Treaty 8 First Nation and respected Dene Elder, Francios Paulette and Athabasca Chipewyan Dene Nation Chief, Allan Adam will be speaking at a pre-conference on July 5th in the Metis settlement of Anzac. They will be joined by author, activist and founder of 350.org, Bill Mckibben, author and 350.org board member Naomi Klein, former US Vice Presidential Candidate, author, and Native American activist Winona LaDuke, and First Nations Hip Hop artist and activist, Wabanakwut (Wab) Kinew. The walk and ceremony for Mother Earth and her Peoples will take place on July 6th. We invite you to join us in this historic occasion by either traveling to Alberta's tar sands in person and walking side by side with us, or by holding an event or ceremony in your home territory in solidarity. This story also appeared on Yes! Magazine. 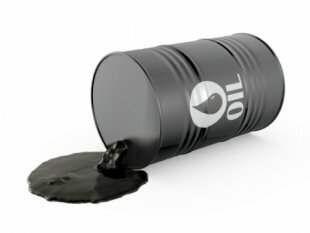 On March 29 Exxon Mobil, the most profitable company in the world, spilled at least 210,000 gallons of tar sands crude oil from an underground pipeline in Mayflower, Arkansas. The pipeline was carrying tar sands oil from Canada, which flooded family residences in Mayflower in thick tarry crude. Exxon’s tar sands crude also ran into Lake Conway, which sits about an eighth of a mile from where Exxon’s pipeline ruptured. A new batch of documents received by Greenpeace in response to a Freedom of Information Act (FOIA) request to the Arkansas Department of Environmental Quality (DEQ) has revealed that Exxon downplayed the extent of the contamination caused by the ruptured pipeline. Records of emails between Arkansas’ DEQ and Exxon depict attempts by Exxon to pass off press releases with factually false information. In a draft press release dated April 8, Exxon claims “Tests on water samples show Lake Conway and the cove are oil-free.” However, internal emails from April 6 show Exxon knew of significant contamination across Lake Conway and the cove resulting from the oil spill. When the chief of Arkansas Hazardous Waste division called Exxon out on this falsehood, Exxon amended the press release. However, they did not amend it to say that oil was in Lake Conway and contaminant levels in the lake were rising to dangerous levels, as they knew to be the case. Instead, they continue to claim that Lake Conway is “oil-free.” For the record, Exxon maintains that the “cove,” a section of Lake Conway that experienced heavy oiling from the spill, is not part of the actual lake. Exxon maintains this distinction in spite of Arkansas Attorney General Dustin McDaniel saying unequivocally “The cove is part of Lake Conway…The water is all part of one body of water.” Furthermore, Exxon water tests confirmed that levels of Benzene and other contaminants rose throughout the lake, not just in the cove area. Though Exxon was eventually forced to redact their claim that the cove specifically was “oil-free,” the oil and gas giant has yet to publicly address the dangerous levels of Benzene and other contaminants their own tests have found in the body of Lake Conway. The Environmental Protection Agency and the American Petroleum Institute don’t agree on everything, but they do agree that the only safe level of Benzene, a cancer causing chemical found in oil, is zero. Benzene is added to tar sands oil to make it less viscous and flow more easily through pipelines. Local people have reported fish kills, chemical smells, nausea and headaches. Independent water tests have found a host of contaminants present in the lake. Exxon’s spill emanated from the Pegasus Pipeline, which like the proposed Keystone XL pipeline, connects the Canadian Tar Sands with refineries in the Gulf of Mexico. I don’t blog. I work all the time, weaving together components of strategy for the people on the frontlines of Alaska who are facing down Big Oil and Mining Companies, and addressing Climate Change. I am also a full time mother, so I rarely have that extra moment to blog. But today I made time, so here it is. So Shell Oil and the Arctic, hmmm well let’s start with what Shell does and is: This company operates around the world and their Industry standard is one of pressuring governments to allow exploration of oil and gas resources in a way that maximizes profits for them at the expense of the environment and human rights, in particular those of Indigenous peoples. Here in Alaska, We’ve seen nearly every large multi-national company come into our homelands. The problem with their presence here is that these big oil companies like Shell have a proven record of negligence and a legacy of pollution in Alaska. Shell itself is encumbered with their own appalling record of Indigenous rights violations, human rights abuses and a trail of broken promises within Indigenous territories in Canada, Nigeria, and Russia. Despite their own destructive record, they expect that Americans and the Inupiat among other Alaska Indigenous coastal tribes will trust them when it comes to offshore development of the Arctic Ocean’s Beaufort and Chukchi Seas? The future of these Oceans and People are in their hands. A scary thought in itself. First of all, the profit-at-all-cost mentality of corporations is the primary threat to Inupiat and the ecosystem that sustains their way of life. Indigenous peoples subsistence rights are intrinsic to the environment due to the intimate connection we have in relation to our physical nourishment, health, cultural practices, spirituality, and social systems. The reality is, the ecosystem, when left intact, is the greatest assurance that subsistence rights will remain intact. Therefore when there is discussion of ensuring subsistence rights in the terms of development it is an absolute contradiction. This week members of the Native Village of Point Hope, Alaska and Athabasca Chipewyan First Nation (ACFN) attended the Royal Dutch Shell AGM to confront the Chairman and Board over Shell’s decision to pursue highly risky ‘extreme energy’ projects without adequate consultation and accommodation of Indigenous communities. Projects such as Arctic offshore drilling and tar sands will have little long-term benefit for the company, and expose it to reputational damage, political and financial risk, including litigation. Resisting Environmental Destruction on Indigenous Lands (REDOIL) sent Mae Hank, Inupiat from Point Hope Alaska to be our representative at the Shell AGM to address the Chairman, Board and Shareholders on behalf of her community. We wanted to show Shell that their risky Alaska offshore plans for the Beaufort and Chukchi Seas impact Indigenous Peoples, the Inupiat of Alaska directly and all Indigenous coastal communities down the western coastline of Alaska indirectly. Sending Mae was a tactic to put a human face to their drilling projects. We felt that they needed a reality check, to be confronted with the human element, not just a financial statistic of their endeavours. They also need to realize that there is a large majority of Inupiat that oppose Shell’s offshore plans and they should not buy the company line “Inupiat support offshore development” Shell lies. Shell must understand the Beaufort and Chukchi Seas of the Arctic Ocean are critical to the Indigenous people of Alaska’s Arctic Slope, the Inupiat and their subsistence way of life, which is interdependent with the marine ecosystem of the Arctic Oceans. 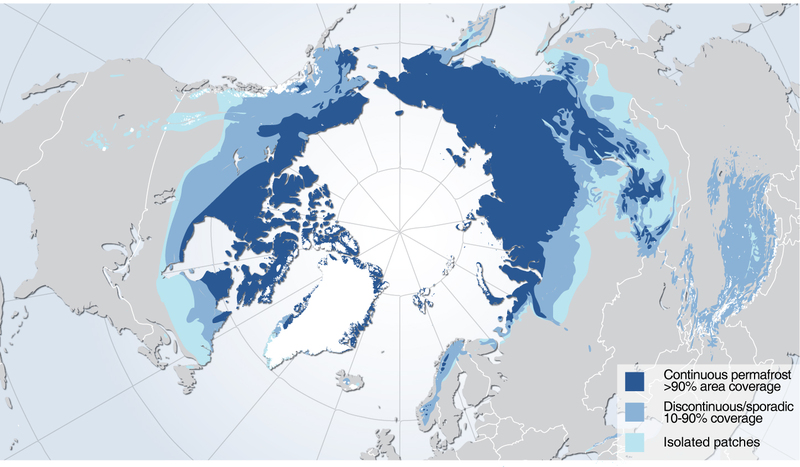 The Beaufort and Chukchi Seas provide critical habitat for the endangered bowhead whale, beluga whales, gray whales, walruses, seals and polar bears as well as staging and molting areas for migratory birds among them threatened spectacled and Steller’s eiders. The Inupiat call the ocean their garden. It provides for all their physical, spiritual, cultural and social needs. The relationship of the people to the ocean runs deep. 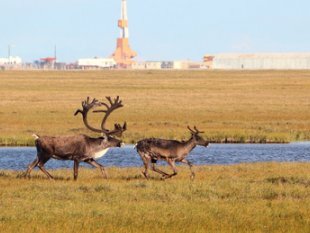 Since 2007, Royal Dutch Shell has been trying to rush through risky exploration drilling proposals for the Beaufort, and Chukchi seas of the Arctic Ocean in Alaska. Litigation, has helped slow this rush to drill there, along with several other events. This year on Feb. 27, 2013 Royal Dutch Shell announced that it has suspended plans for oil drilling in the Arctic Ocean for 2013 due to a year of mishaps. Crazy mishaps, almost like a running cartoon…Last summer a massive sheet of ice halted their drilling program, and their oil spill containment dome — to cap a blowout in an emergency in Arctic operations — failed miserably in tests. The dome “breached like a whale” after malfunctioning, and then sank 120 feet. When they recovered the 20-foot-tall containment dome, it had “crushed like a beer can” under pressure, this year the Kulluk drill rig ran aground on New Year’s Eve, and the Noble Discoverer drill ship is the subject of a criminal investigation over safety and pollution-related violations among other events. Umm yeah, they are “Arctic Ready” aha sure. In spite of the inundation of substantial problems throughout and after the drilling season, Shell plans to continue it’s efforts for exploratory drilling in 2014 in the Chukchi and Beaufort Seas. The massive drilling plans project an estimated 174 exploratory and extraction wells within critical habitats of culturally sensitive marine mammals. Shell Oil and associated agencies lack huge gaps of information of the harsh conditions, current and tidal systems, ever changing and unpredictable ice, and dangers of the Arctic Ocean; in turn, which could potentially lead to a very large oil spill. An oil spill in the remote Arctic ecosystem would be devastating – currently, there is no effective way to clean up an oil spill in Arctic conditions, and there is a lack of infrastructure in the region to support an adequately safe drilling or cleanup program. In this author’s humble opinion, when it comes to offshore drilling in Alaska the risks outweigh the benefits in this case, and there is absolutely no way that shell can operate safely in the Arctic environment under the cover of darkness, severe cold weather, perilous storms and broken ice conditions. When we take a look at the ridiculous mishaps that occurred with their Arctic Activity last year, this is very clear. To date there is still no viable spill plan in place. If drilling offshore in the Beaufort and Chukchi seas resumes we could be left with another spill like the deepwater horizon spill in the Gulf of Mexico and the destruction of one of our planet’s most vital ecosystems. Faith Gemmill is the Executive Director of Resisting Environmental Destruction of Indigenous Lands (REDOIL). REDOIL is a movement of Alaska Natives of the Inupiat, Yupik, Aleut, Tlingit, Eyak, Gwich’in and Denaiana Athabascan Tribes who came together in June 2002 in Cordova, Alaska to form a powerful entity to challenge the fossil fuel and mining industries and demand our rights to a safe and healthy environment conducive to subsistence. By now, the world knows Medea Benjamin as either the woman who challenged—or heckled—President Obama last Thursday during his speech on drones and Guantanamo Bay. “People think you’re rude and crazy,” a CNN reporter told Benjamin, the co-founder of two global peace organizations, CodePink and Global Exchange. But Benjamin, already well-known among peace activists and political progressives (she was a major force during Ralph Nader’s 2000 presidential campaign) has also inspired legions of new fans astonished that someone had the nerve—or the passion—to stand up to one of the most powerful men on earth. Now Benjamin has been trying to turn her moment in the mainstream media spotlight to the issues that brought her to the National Defense University at Fort McNair in Washington, D.C. on Thursday in the first place. We talked to her about what happened and the issues that fuel her activism and her next steps. Evelyn Nieves: Were you surprised that President Obama actually addressed you on Thursday rather than simply give the nod to the Secret Service to nab you as soon as you spoke out? Do you think it signals a president who is willing to listen? How does his response compare with other presidents and leaders whom you've publicly challenged in the same way? Medea Benjamin: Many politicians try to ignore or belittle the folks who interrupt them. I think President Obama is just a really good politician who recognizes that it is better to address the person than have them dragged out. I was grateful that he said that my voice was worth listening to, though it was quite surreal because as the president and I were “dialoguing,” I was surrounded by army, FBI and Secret Service threatening to arrest me and drag me out. But every time they touched me I said that the president was talking to me, and if they made a scene by pulling me out, they would really regret it. That bought me some valuable time. Nieves: You spoke up when President Obama mentioned Guantanamo, which has yet to infiltrate the American consciousness despite the growing crisis there. What are you hoping your exchange with the president will do to foster outrage and pressure to finally close Gitmo and release innocent detainees? Benjamin:These detainees are in desperate straits. It’s both a humanitarian and a political crisis. Despite the force-feeding, some of these men could start to die, and this could unleash another huge wave of anti-American riots around the Muslim world. So something must be done right away. The president is saying that Congress is to blame, and yes, Congress has placed ridiculous roadblocks to closing Guantanamo. But Congress also put in place a waiver system that the president could use immediately to release the 86 prisoners who have been cleared for release. He did announce a lifting of the self-imposed ban on repatriating prisoners to Yemen, and that is positive. But he needs to go beyond nice words and bureaucratic measures: He needs to immediately start authorizing some releases, so that the prisoners will see progress and stop the hunger strike. Then we can tackle the larger issue of giving fair trials to the remaining prisoners. In the meantime, my colleagues and I at CodePink will be doing more to keep up the pressure, working with the Guantanamo lawyers and groups like Witness Against Torture, Amnesty, The World Can’t Wait and National Religious Campaign Against Torture. We’re planning more protests and civil disobedience at the White House, a vigil at the gates of the Guantanamo prison itself, a delegation to Yemen to meet with family members and government officials. We’ve got many plans. Nieves: You've written a book on drones, another subject that has not permeated the public consciousness to the extent that it might given its profound repercussions. In brief, what do you want the public to know about drones? What do you want the president to do about drones? Benjamin: The president said he uses drones when capture is not possible, but that’s just not true. The drones have been an alternative to capture. I think we should stop using these killer drones. They have led to the death of so many innocent people. They have become a recruiting tool for extremists and only guarantee what the president said he is against: a state of perpetual war. We should address terrorism through better policing, better defense mechanisms here at home and more robust and creative diplomacy. Nieves: What's your next step? Do you really think you'll get into speeches now that the whole world will be looking for the woman in pink? Benjamin: Probably, but I won’t be in pink. And if not me, it will be one of my colleagues. Until the policies change, we’ll still be like fleas, biting at the heels of the powerful. Or perhaps more like gadflies. Nieves: How do you do what you do? People are in awe of your boundless energy and willingness to put yourself out there. How many times have you been arrested, for instance? How long do you think you can do this (i.e. public protest)? “Was it Cesar Chavez? Maybe it was Dorothy Day. Some will say Dr. King or Gandhi set them on their way. No matter who your mentors are it's pretty plain to see. And I love to sing in jail—great acoustics. Nieves: Not everyone can be a public citizen to your extent. What are your recommendations for the faint of heart? What do you suggest a newbie activist do in the cause of, say, Gitmo closure? Or any cause for peace? Benjamin:Start out within your comfort zone and then keep pushing yourself to the next step. Sign petitions. Call the White House (202-456-1414) and your congressperson/senators. Make donations to peace groups you admire. Those are great individual acts. But you’ll be more powerful as part of a group. Join a local peace group and or start your won. Re: Gitmo, go to the thrift store to buy an orange T-shirt, make a CLOSE GITMO sign, download some of our flyers and stand in front of a federal building. Invite the press to come talk to you. From there it can snowball, if you keep pushing, reaching out to new allies, using the collective wisdom and ideas. And while we’re dealing with deadly serious issues, make sure to inject some joy and creativity into your actions—for that’s what keeps people engaged. Nieves: You're now loved and hated more than ever. In China, you'd be under house arrest or followed everywhere you go. What do you intend to do differently now that, decades later, you're a household voice/face/name? Benjamin:We activists have our 15 minutes of fame every now and then, and then we go right back to the more tedious work of organizing. I’m still on a book tour for my book Drone Warfare, and I really enjoy speaking to community groups and students. I’ll be leaving for Yemen soon, and then probably to the gates of Guantanamo. We’re organizing an international conference on drones in London in November. We’re constantly meeting with those in Congress—and asking for meetings with folks at the White House. Someone started a petition asking President Obama to invite me to the White House for a beer. But I’d prefer a few mojitos with real Cuban rum—and a toast to changing another failed policy: the 50-year-old embargo on Cuba. Evelyn Nieves is a freelance writer living in San Francisco. She has been a reporter for both the New York Times and the Washington Post. RESTON, Virginia, May 23, 2013 (ENS) – Aquifers across the United States are being drawn down at an increasing pace, finds a new study released today by the U.S. Geological Survey. The report, “Groundwater Depletion in the United States (1900-2008),” evaluates long-term cumulative depletion volumes in 40 separate aquifers in the United States, bringing together information from previous studies and from new analyses of these distinct underground water storage areas. Since 1950, the use of U.S. groundwater resources for agricultural, industrial, and municipal purposes has expanded. When groundwater is withdrawn from subsurface storage faster than it is recharged by precipitation or other water sources, the result is groundwater depletion.“Although groundwater depletion is rarely assessed and poorly documented, it is becoming recognized as an increasingly serious global problem that threatens sustainability of water supplies,” writes report author USGS hydrologist Leonard Konikow. The depletion of aquifers has many negative consequences, including land subsidence, reduced well yields, and diminished spring and stream flows. Groundwater depletion in the United States in the years 2000-2008 can explain more than two percent of the observed global sea-level rise during that period, Konikow found. To demonstrate the scale of depletion across the country, data from the report show that from 1900 to 2008, the nation’s aquifers were drawn down by more than twice the volume of water found in Lake Erie. “Groundwater is one of the nation’s most important natural resources. It provides drinking water in both rural and urban communities. It supports irrigation and industry, sustains the flow of streams and rivers, and maintains ecosystems,” said Suzette Kimball, acting USGS Director. The maximum rates of depletion have occurred during the most recent period of the study from 2000 to 2008, when the depletion rate averaged almost 25 cubic kilometers per year.“Because groundwater systems typically respond slowly to human actions, a long-term perspective is vital to manage this valuable resource in sustainable ways,” Kimball said. By comparison, 9.2 cubic kilometers per year is the historical average calculated over the entire 1900–2008 timespan of the study. One of the best known and most investigated aquifers in the country is the High Plains aquifer, also called the Ogallala aquifer. It underlies more than 170,000 square miles of the Midwest and represents the principal source of water for irrigation and drinking in this agricultural area. Substantial pumping of the High Plains aquifer for irrigation since the 1940s has resulted in large water table declines that exceed 160 feet in places. The USGS study shows that, since 2000, depletion of the High Plains aquifer is continuing at a high rate. The depletion from 2001 through 2008 is about 32 percent of the cumulative depletion in this aquifer during the entire 20th century. The annual rate of depletion during this recent period averaged about 10.2 cubic kilometers, roughly two percent of the volume of water in Lake Erie. The cumulative volume of groundwater depletion in the United States during the 20th century is large – totaling about 800 cubic kilometers and increasing by an additional 25 percent during 2001–2008 to a total volume of approximately 1,000 km3. Cumulative total groundwater depletion in the United States accelerated in the late 1940s and continued at an almost steady linear rate through the end of the century. In addition to the environmental consequences, depletion also adversely affects the long-term sustainability of groundwater supplies to help meet the nation’s water needs. Five years ago, Hickory Edwards was called to the water. A citizen of the Onondaga Nation, whose territory just south of Syracuse is the heart of the Haudenosaunee Confederacy (also known as the Six Nations or Iroquois), Edwards had never explored the rivers and streams that traverse the league's traditional homeland in upstate New York. "I went to my cousin's house and they had just gotten a two-person kayak, so I borrowed one and went with them down the Onondaga Creek," Edwards remembered. "I knew it was an old trading route from our peoples. I got out on the water and brought my cousin along and we just headed east into the rising sun." Nine days later, he was in Mohawk Country, 150 miles away. Sometimes alone, often with friends or family, Edwards has been making the trip ever since. "It's something I think I was put here for," he said. In July, Edwards' annual journey will change course -- and get a lot bigger. This year marks the 400th anniversary of the first treaty between the Haudenosaunee Confederacy and European settlers. Consecrated with the Two Row Wampum -- a belt of purple and white beads still held by the Onondagas -- the agreement committed the parties to friendship, peace and sovereignty, each row representing the parallel paths of Indians and settlers. It was to hold force "as long as the grass is green, as long as the rivers flow downhill and as long as the sun rises in the east and sets in the west." Successive settler governments -- first the Netherlands, followed by England, and eventually the United States -- renewed these basic principles, knowing their survival was linked to the good relations and guidance of their native neighbors. The U.S. Constitution's sixth article even enshrined such treaties as "supreme Law of the Land." In the 1790s, Congress explicitly prohibited the seizure of land without federal approval and Indian consent. But laws made were not necessarily laws obeyed. As New York became the "Empire State," Six Nations territory was reduced by coercion, subterfuge and outright violence, their former lands ransacked by ecological exploitation. Onondaga, one of a half dozen Haudenosaunee sovereignties in upstate New York (there are more in Canada), now amounts to only 9.3 square miles. Haudenosaunee leaders have long pushed to reverse these trends. This summer, their efforts will receive an historic boost. A yearlong educational effort to mark the four-century anniversary of the original treaty, the Two Row Wampum Renewal Campaign seeks to enact a three-part vision of "peace, friendship, and a sustainable future in parallel forever." The culmination in late July is a massive canoe trip down the Hudson River from Albany to New York Harbor. 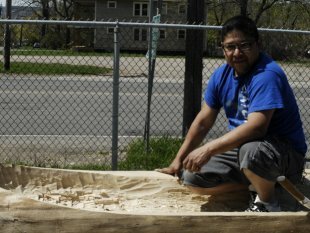 Coordinating the some 300 paddlers is Edwards, who's building a dugout canoe using the age-old methods of his ancestors. "We have the possibility to build a movement that shifts New York State's thinking," said Andy Mager, an organizer with Neighbors of the Onondaga Nation, one of the key coalition partners in the campaign. Founded in 1999 by the Syracuse Peace Council, NOON has worked to build solidarity and understanding among the area's non-native residents, a task that became particularly vital in 2005. That year, the Onondagas filed a land rights action petitioning the federal court to declare that New York violated the law when it seized Onondaga land. They also challenged five corporations -- Honeywell International among others -- which turned Onondaga Lake, the birthplace of the Haudenosaunee Confederacy, into one of the most polluted bodies of water in North America. "It is the duty of the Nation's leaders to work for a healing of this land, to protect it, and to pass it on to future generations," Sid Hill, Tadadaho (spiritual leader) of the Onondaga Nation, said at the time. He hoped it would "hasten the process of reconciliation and bring lasting justice, peace, and respect among all who inhabit this area." Though the Onondagas explicitly stated that a victory in court would yield no evictions, NOON recognized a need to educate the community. "We saw how much controversy had erupted in other neighboring communities when the Cayugas or the Oneidas had filed their land claims, just based out of sheer ignorance and misunderstanding," said Lindsay Speer, another NOON organizer. "I think we were actually really successful." The courts were less open-minded. Repeatedly rejecting the Onondagas' claim, they refused even to hear the evidence. Meanwhile, in 2005, the Supreme Court ruled against the Oneidas (another member of the confederacy), relying in part on the "Doctrine of Discovery," a 15th-century papal bull granting Christian explorers the right to seize "pagan" land and incorporated into U.S. jurisprudence by John Marshall in 1823. Many in the community began realizing the need for a broader educational effort that reached beyond central New York. When several hundred canoes arrive at Pier 96 at 57th street on Manhattan's west side on August 9, they'll at least be difficult to ignore. "Hopefully, we'll reach enough people that when it comes down to even the basic arguments inside of someone's house, we'll have more people defending us," said Lena Duby, who's helping to coordinate on-the-ground support for the paddlers. The campaign reaches beyond issues that affect only indigenous people. With New York Governor Andrew Cuomo expected to announce whether he'll lift the state's moratorium on natural gas drilling in the next months, organizers have made opposition to fracking a key tenet of Two Row Renewal. The Marcellus Shale runs directly under both the Haudenosaunee's traditional homeland and the Onondaga's territory. For many, the equation is simple. "You can't live without water. Water is life," Edwards said. The highly invasive fracturing process mixes millions of gallons of freshwater with numerous (and largely undisclosed) toxic chemicals, injecting the admixture deep underground to push natural gas above. Just over the Pennsylvania border, about 80 miles to the south of Onondaga, fracking has already scarred the land. Pointing at a soft rise at the Onondaga Nation's southern border, Edwards explained, "Our water comes right from that hill over there. That's where we drink from." Some of their neighbors have already sold rights to natural gas companies. "Everything around here will get contaminated," he added. Jake Edwards, chief of the Onondaga Nation and Edwards' uncle, believes the Two Row Wampum offers a different path. "In order to heal the environment, as the modern world calls it, then our people need a healing also," he said at the New York City launch of the campaign in March. "Treaties should've been honored 400 years ago and carried on. Our environment wouldn't be in the bad shape it is if we paid attention to the original agreements." With threat of catastrophic climate change looming, it's a lesson the campaign's leaders believes people are ready to hear. "Nature's going to help our message," said Oren Lyons, faithkeeper of the Onondaga's Turtle Clan and a veteran of the Red Power movement, referring to the rise in extreme weather linked with global warming. "Nobody's exempt from this." Andrew Bard Epstein is a graduate student in American history at Yale. He hosts the podcast series, New Books in Native American Studies. Follow him on Twitter @andeps.